In July 1981, Dr. Hochman became assistant to President Carter, helping him with the research and editing of "Keeping Faith: Memoirs of a President" (1982). He has continued to support President Carter with subsequent publications and other scholarly activities as well as with projects of The Carter Center. He was appointed senior research associate at the newly founded Center in September 1982. Dr. Hochman received his doctorate in history from the University of Virginia, where from 1968 to 1981, he assisted Dumas Malone with his Pulitzer Prize-winning six-volume biography of Thomas Jefferson. He is an adjunct professor in the Emory University Department of History and also has taught in the Department of Political Science. 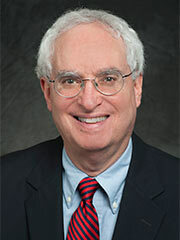 In his research and writings, he has focused on the history of the United States and the American presidency. A special interest of his is the role of nongovernmental organizations in public policy. He is a member of the Jimmy Carter National Historic Site Advisory Commission and served as an advisor for the renovation of the Museum of the Jimmy Carter Library.